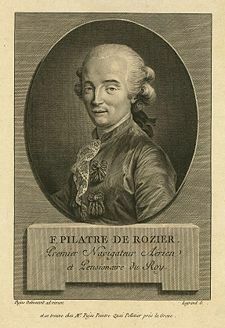 Jean-Franx�ois Pilx�tre de Rozier (30 March 1754 - 15 June 1785) was a French chemistry and physics teacher, and one of the first pioneers of aviation. 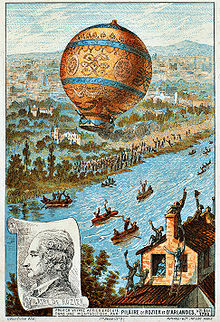 He and the Marquis d'Arlandes made the first manned free balloon flight on 21 November 1783, in a Montgolfier balloon. He later died when his balloon crashed near Wimereux in the Pas-de-Calais during an attempt to fly across the English Channel. He and his companion, Pierre Romain, became the first known fatalities in an air crash. He was born in Metz, the third son of Magdeleine Wilmard and Mathurin Pilastre, known as "du Rosier", a former soldier who became an innkeeper. His interests in the chemistry of drugs had been awakened in the military hospital of Metz, an important garrison town on the border of France. He made his way to Paris at the age of 18, then taught physics and chemistry at the Academy in Reims, which brought him to the attention of Monsieur, the comte de Provence, brother of King Louis XVI. He returned to Paris, where he was put in charge of Monsieur's cabinet of natural history and made a valet de chambre to Monsieur's wife, Madame, which brought him his ennobled name, Pilx�tre de Rozier. He opened his own museum in the Marais quarter of Paris on 11 December 1781, where he undertook experiments in physics, and provided demonstrations to nobles. He researched the new field of gases, and invented a respirator. Picture - The first tethered balloon ascent on 15 October 1783 by Rozier. After several tethered tests to gain some experience of controlling the balloon, de Rozier and d'Arlandes made their first untethered flight in a Montgolfier hot air balloon on 21 November 1783, taking off at around 2 p.m. from the garden of the Chx�teau de la Muette in the Bois de Boulogne, in the presence of the King. Their 25-minute flight travelled slowly about 5� miles (some 9 km) to the southeast, attaining an altitude of 3,000 feet, before returning to the ground at the Butte-aux-Cailles, then on the outskirts of Paris. Picture - The first untethered balloon flight, by Rozier and the Marquis d'Arlandes on 21 November 1783. Along with Joseph Montgolfier, he was one of six passengers on a second flight on 19 January 1784, with a huge Montgolfier balloon Le Flesselles launched from Lyon. Four French nobles paid for the trip, including a prince. Several difficulties had to be overcome. The wallpaper used to cover the balloon's envelope became wet because of extreme weather conditions. The top of the balloon was made of sheep- or buckskin. The air was heated by wood in an iron stove: to start, the straw was set on fire with brandy. (In other tests charcoal or potatoes were used). The balloon had a volume of approximately 23,000 m�, over 10 times that of the first flight, but it only flew a short distance. The spectators kneeled down when the balloon came down too quickly. That evening the aeronauts were celebrated after listening to Gluck's opera, Iphig�nie en Tauride. 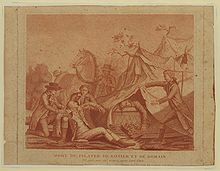 Picture - Fatal accident at Wimereux, 15 June 1785. De Rozier's next plan was an attempt to cross the English Channel from France to England. 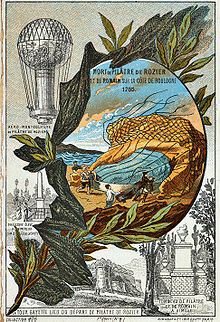 A Montgolfier balloon would not be up to the task, requiring large stocks of fuel for the hot air, so his balloon the Rozix�re balloon was a combination hydrogen and hot air balloon. It was prepared in the autumn of 1784, but the attempt was not launched until after another Frenchman, Jean-Pierre Blanchard, and American companion, Dr John Jeffries, flew across the English Channel in a hydrogen gas balloon on 7 January 1785, from England to France. Despite several attempts, De Rozier and his companion, Pierre Romain, were not able to set off from Boulogne-sur-Mer until 15 June 1785. After making some progress, a change of wind direction pushed them back to land some 5 km from their starting point. The balloon suddenly deflated (without the envelope catching fire) and crashed near Wimereux in the Pas-de-Calais, from an estimated height of 1,500 feet. Both occupants were killed. Eight days later his fianc�e died, possibly having committed suicide. A commemorative obelisk was later erected at the site of the crash. The King had a medal struck, and gave his family a pension. Picture - Deaths of Rozier and Romain. The modern hybrid gas and hot air balloon is named the Rozix�re balloon after his pioneering design. Barth�lemy Faujas de Saint-Fond (1783, 1784) Description des exp�riences de la machine a�rostatique de MM. Montgolfier, &c.
Simon Schama (1987) Citizens, p. 123-31.